BMW has announced the latest flagship of its SUV X-line-up. The company says this latest 4×4 offers “exclusivity, spaciousness, superior quality, strong performance, agile handling and off-road capability”. The X7 is the largest model in the BMW X range. The new BMW X7 is 5,151mm long, 2,000mm wide and 1,805mm tall, with a wheelbase of 3,105mm. In terms of design, the BMW X7 has a three-dimensional version of the bar that turns upwards at its outer edges. At the front, Adaptive LED headlights and front foglamps are standard, while BMW Laserlights are optional. This system employs a spotlight with Selective Beam delivering a non-dazzling high beam range of 600 metres. Grille bars in Aluminium Matt and an array of accents in High-Gloss Chrome, plus 21-inch light-alloy wheels in Y-spoke design, are included on the entry model as standard. The M Sport model features extra-large air intakes, M-specific 21-inch light-alloy wheels in M twin-spoke design and a distinctive look for the front apron, rear apron and side skirts. It also includes additional design elements in High-gloss Black or Black Chrome – a shade reserved for BMW’s luxury-class models. Trim elements in High-gloss Chrome can be specified as an option, while options for the BMW Individual range include Sunstone metallic paint and 22-inch light-alloy wheels. The BMW X7 has three rows of seats that offer space for up to seven adults. The third row has two full-size seats with space between them – claimed to be a first for a 4×4. A standard-fit glass roof adds to the spacious feel while cupholders and armrests integrated into the side panel trim offer additional comfort. The second row includes three seats in a conventional rear-seat bench configuration although customers can specify two individual seats that offer the same functionality and adjustment range as the front seats. These optional seats feature integrated armrests, comfort cushions and cup-holders extended from the front centre console. In both the standard and optional configuration, the second-row seats can slide longitudinally through 14.5mm (in seven-seater form). Adjustment of the fore/aft position – like all other seat positions and backrest angles – is electric, and the backrests in the second and third rows fold down electrically. The seats in the second row can also be tilted forward to make getting in and out as easy as possible for third-row passengers. The second-row seats can be returned to their upright position at the touch of a button, at which point child seats can be fixed in place using the ISOFIX attachments. The fore/aft position of the second-row seats is adjusted using a control panel integrated into the driver’s door. Boot capacity is 326 litres and increases to a maximum 2,120 litres when the backrests of the seats in the second and third rows are folded down. The standard air suspension allows the car to be lowered (at the touch of a button in the boot, via the display key or rocker switch within the centre console) to make loading easier. The new BMW X7 features a two-section split tailgate, both elements of which have electric opening and closing as standard. If the optional Comfort Access is specified, the tailgate opens and closes automatically and hands-free. The BMW X7 features an electrically-operated panoramic glass roof as standard. The front, central and rear glass elements all have an electrically sliding headliner activated from a control panel in the front section of the roof. If the optional electric sun blinds for the windows in the rear doors are specified, rear passengers gain a button for operating the headliner. The Panorama glass roof Sky Lounge, meanwhile, features LED lighting spread evenly across the glass surfaces to illuminate more than 15,000 graphic patterns and generate a display reminiscent of a starlit sky. A ten-speaker hi-fi comes as standard, while the optional Harman Kardon surround sound system features 16 speakers. Customers can specify the Bowers & Wilkins Diamond Surround Sound System with 20 speakers and 1,500-watt amplifier. The optional Rear-Seat Entertainment Professional system comprises a pair of 10.2-inch full-HD touchscreen displays, Blu-ray-compatible DVD player, two USB ports, HDMI socket and two headphone jacks. The third row of seats has access to two further USB ports. The X7 uses the latest BMW Operating System 7.0 display and control system, which allows those in rear to select and operate entertainment functions. The rear-seat passengers can use both their own media sources and those available in the front compartment. A navigation map and BMW ConnectedDrive services can also be accessed in the rear seats. The engine line-up includes a newly developed a six-cylinder in-line petrol unit for the BMW X7 xDrive40i and a pair of six-cylinder in-line diesels to power the BMW X7 xDrive30d and BMW X7 M50d M Performance models. Petrol and diesel units feature turbochargers and are aligned to eight-speed Steptronic transmission, which has a wider gear ratio spread and new control electronics. This reduces engine speeds, particularly in higher gears, which helps to increase overall efficiency. The BMW xDrive all-wheel-drive system now varies how the drive torque is split between the front and rear wheels to provide better handling. It links up with Dynamic Stability Control (DSC) and, for added efficiency, full-drive power can be directed to the rear wheels in situations where all-wheel drive is not required, or for more sportier driving. An M Sport differential is fitted as standard on the BMW X7 M50d and in conjunction with the Off-Road package. This electronically controlled rear differential lock also hooks up with the DSC system. This set-up combines to reduce understeer. It also increases traction on loose surfaces or roads that require differing levels of grip for the left and right rear wheels. The chassis of the BMW X7 features a double-wishbone front axle and a five-link rear axle combination to provide maximum ride comfort and agile handling. Ride comfort is further enhanced by its two-axle air suspension with standard-fit automatic self-levelling. The new BMW X7 M50d features the M Sport differential, exclusive 22-inch M light-alloy wheels finished in cerium grey and a model-specific chassis set-up. When SPORT mode is engaged, or the car’s speed exceeds 86mph, the ride height is automatically lowered by 20mm. The driver is also able to adjust the body’s ground clearance – for off-road driving, for example – by pushing a button in the cockpit to raise it in two stages up to 40mm above the standard setting. Another button in the luggage compartment activates a loading mode that lowers the car by 40mm. Integral Active Steering is available as an option. This turns the rear wheels in either the same or the opposite direction as the front ones. Customers can select the Executive Drive Pro option, which adds active roll stabilisation and has the added effect of increasing straight-line driving comfort by countering the vibrations triggered by bumps on one side of the road. The Off-Road package is available for all model variants apart from the BMW X7 M50d and it features its own special graphics in the instrument cluster and Control Display, as well as an extra button on the centre console for selecting four driving modes – xSnow, xSand, xGravel and xRocks. Standard equipment on the X7 includes the BMW Intelligent Personal Assistant, a digital helper that responds to the prompt “Hey BMW”. The BMW Intelligent Personal marks the start of a new era in which drivers will increasingly be able to operate their car, access its functions and obtain information simply by speaking. Updates to this system will be continuous and can be made on a smartphone and in-car via the Remote Software Upgrade functionality. The BMW Intelligent Personal Assistant learns routines and learns the driver’s preferences such as seat heating settings or the places they navigate to frequently (“Take me home”). Unlike other systems, the driver can give the assistant a name, and it can even provide casual conversation. Saying “Hey BMW, I’m cold” will prompt the BMW Intelligent Personal Assistant to adjust the temperature inside the car accordingly. The assistant gets better with every command given, every question asked and every setting made. The BMW Intelligent Personal Assistant is also able to explain all sorts of different functions, for example “How does the High Beam Assistant work?”, it can provide status updates of the car with regards to fuel and oil levels and help to answer a range of other questions. It can even activate a range of functions to enhance well-being. For instance, “Hey BMW, I feel tired” triggers a programme that adjusts the lighting mood, music and temperature to make the driver feel more awake. It can log frequent destinations, find available parking spaces, provide traffic and remind the driver when to set off for an appointment. 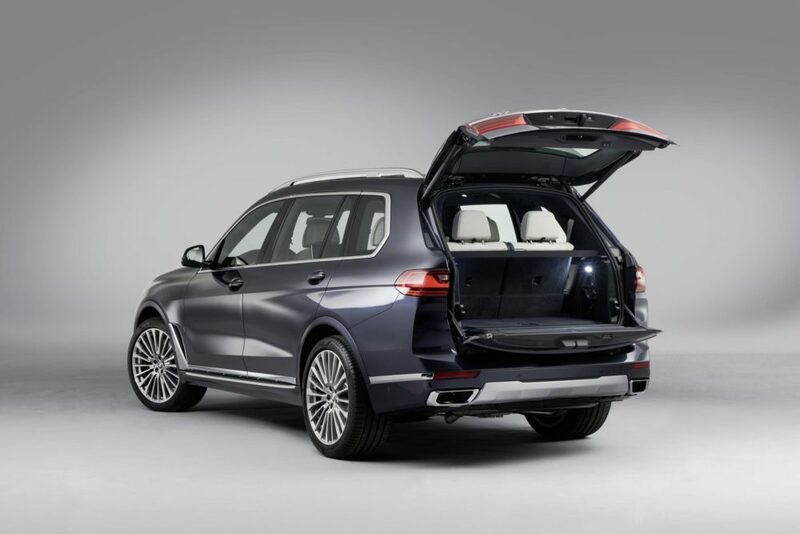 The assistant’s integration with Microsoft Office 365 and Skype for Business transforms the BMW X7 into a voice-controlled mobile office and it can even enable the driver to join teleconferences when required through one press of the iDrive controller. With the driver’s consent, passengers can connect their smartphone to the car using the Connected Command function and then use it to control functions such as navigation, climate control or on-board entertainment. Intelligent Personal Assistant is part of the standard specification (with a subscription period of three years from build) along with the Live Cockpit Professional and the new BMW Operating System 7.0.